How do we show the sequence of processes? 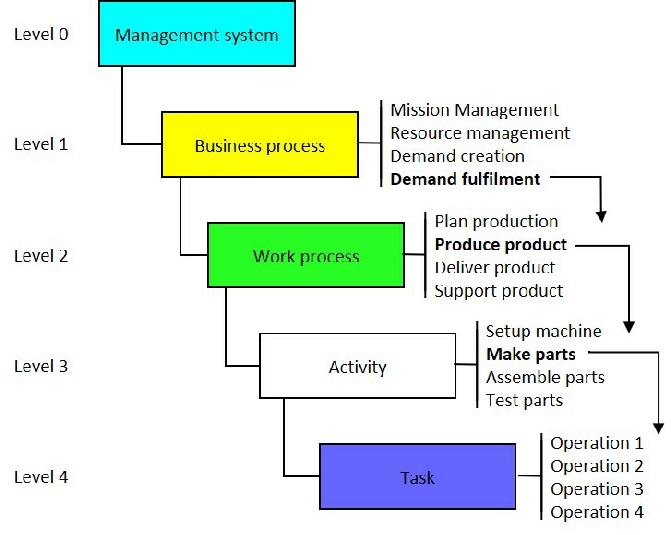 From diagram above we see that the business process we call Demand Fulfilment has 4 work processes. We can show these graphically in different ways. The first thing we must do is plan production but once planned, we do not re-plan production every time so we can take the demand and proceed immediately to product product. The second thing we must do is to Produce Product but we may not need to if we have sufficient existing stock. The third thing we must do is to Deliver Product but some product we deliver we may not produced to order and may be drawn from stock acquired through the Resource Management process. Lastly we may or may not support the product - it may depend on what type of product it is. Therefore with this form of presentation we can be very flexible. 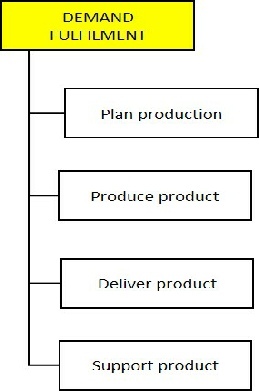 This diagram shows a sequence of 4 critical work processes and by linking them together we imply that the outputs from one work process are inputs to the next process in the sequence shown. This may be accurate in some cases but it is likely there will be exceptions such as those mentioned in the adjacent column which this diagram does not accommodate. It is a question of what one wants to convey by these diagrams. If users take them too literally they might not fulfil their purpose.